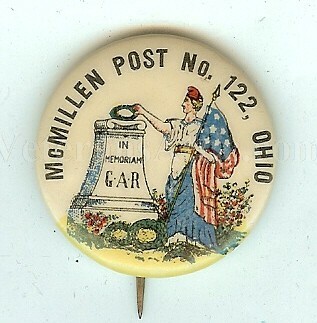 A nice pin back worn by Union veterans who were members of the McMillen Post No. 122 of South Charleston, Ohio. The pin back has a woman holding a U.S.flag putting a wreath on a G.A.R. monument. Written around the graphics is "McMillen Post No. 122, Ohio". 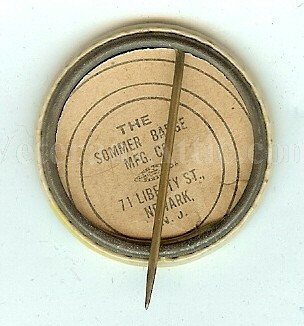 The badge was made by the Sommer Badge Manufacturing Company of Newark, New Jersey as noted in the back of the pin back. The pin is approximately 1 1/4 inches wide. A neat pin back from the 1933 Grand Army of the Republic Department of Ohio 67th Annual Encampment held in Newark, Ohio. The pin back has Major General John L. Clem's likeness in the middle of the pin back. Written around the likeness is "67th Annual Encampment - Dept. Ohio G.A.R. - Maj. Gen. John L. Clem - Newark, Ohio June 18 - 22, 1933". The pin back is approximately 1 1/2 inches wide. 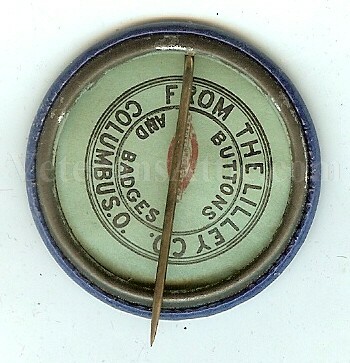 The pin back was made by the Lilley Company, Columbus, Ohio as noted in the back of the pin back. When President Abraham Lincoln in May 1861 issued the call for volunteers to serve in the Union army for a three year term, one of those who tried to answer was Ohio resident John Clem. Not yet 10 years old, Clem’s service was refused by the newly formed 3rd Ohio. Undeterred, Clem later tried to join the 22nd Michigan, where his persistence won over the unit’s officers. They agreed to let him follow the regiment, adopting him as a mascot and unofficial drummer boy. The officers also chipped in to pay his monthly salary of $13 before he finally was allowed to officially enlist in 1863. Clem’s legend grew following the battle, although some stories may be apocryphal. One holds that his drum was destroyed at the Battle of Shiloh, earning him the nickname “Johnny Shiloh” and serving as inspiration for the song, “The Drummer Boy of Shiloh.” However, the 22nd Michigan, Clem’s unit, was not mustered until the summer after the Battle of Shiloh, making it unlikely Clem saw action in the battle with that regiment. 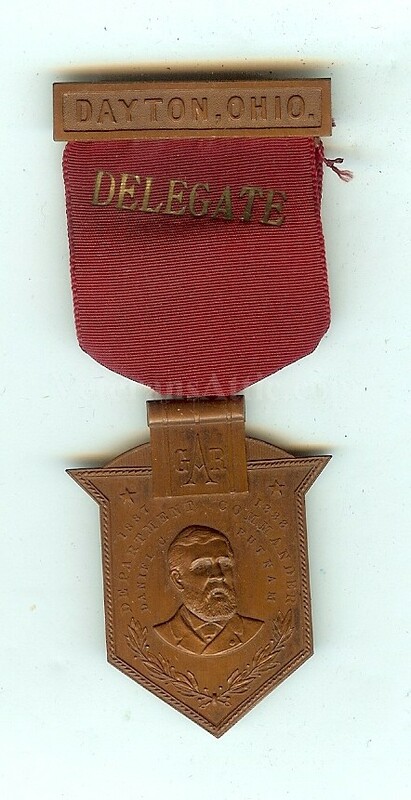 A pin back worn at the 1934 Grand Army of the republic, Department of Ohio Annual Encampment held in Columbus, Ohio. The imagein the middle of the pin back is Captain henry M. Neil. Captain Neil enlisted in January, 1862 in the 11th Ohio Light Artillery. On April 28. 1863 he was transferred to the 22nd Ohio Light Artillery. The pin back is approximately 1 1/2 inches wide. 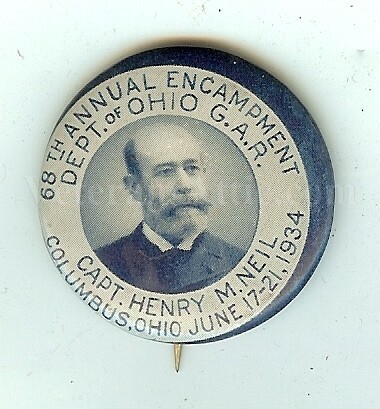 Written around Captain Neil's image on the pin back is "68th Annual Encampment - Dept. of Ohio G.A.R. - Capt. Henry M. Neil - Columbus, Ohio June 17 - 21, 1934". Eleventh Independent Battery Light Artillery. — Capts., Archibald G. A. Constable, Frank C. Sands, Fletcher E. Armstrong; First Lieuts., Henry M. Neil, Cyrus Sears, William M. Wynne; Second Lieuts., William D. Linn, David A. Southworth, William K. Perrine, Amos B. Alger, William Bush, Milon D. Whaley, John A. McArthy. This battery was mustered into service Oct. 27, 1861, at St. Louis arsenal, Mo., by Lieut. George B. Sanford, 1st U. S. cavalry, to serve for three years, aggregating 151 men, rank and file. Its first actual service was with the New Madrid expedition, from which it brought in 2 Confederate 6-pounder guns as trophies of its success, and then it remained in camp until April 12, improving the time by drilling in field maneuvers. During the siege, and in the battles and skirmishes resulting in the evacuation of Corinth, the battery bore its full share. In September it went into action at Iuka, 102 strong, and during the engagement was charged three different times, suffering a loss of 2 officers and 55 men killed or wounded, 18 being killed on the field and others dying afterward. Not a man flinched and numbers were killed or wounded after the Confederates had passed the muzzles of the guns, some of them nobly dying in the attempt to spike their pieces. But, severely as the battery suffered in this engagement in the loss of men and equipments, it was in a short time again ready for the field and took a prominent part in the battle of Corinth, nobly maintaining its reputation for efficiency and gallantry and suffering a loss of 5 men wounded during the action. During the siege of Vicksburg it was held in reserve and participated in several expeditions to the rear, fighting as occasion required. On the day of the capitulation it was camped at Snyder's bluff on the Yazoo river. The battery was mustered out on Nov. 5, 1864. Twenty-second Independent Battery Light Artillery. — Capts., Henry M. Neil, Amos B. Alger; First Lieuts., George W. Taylor, Peter Cornell, Harvey Burdell, Silas H. Towler; Second Lieuts., Jacob M. Sharp, William West. A section of this battery was organized April 1, 1863, and placed on duty at Wheeling, W. Va., and in Holmes county, Ohio. This section was brought back to Camp Chase on June 19, 1863, the organization completed, and mustered into service on July 14, 1863, by Capt. J. L. Proctor of the 18th U. S. infantry, to serve for three years. The battery was sent to Parkersburg, W. Va., and thence to Wheeling. From Wheeling it moved to Hancock, Md., in support of Gen. Kelley, and then returned to Parkersburg, sending out detachments in pursuit of Gen. Morgan, then on his raid through Indiana and Ohio. After the capture of Morgan the battery returned to Camp Chase. On Aug. 12, 1863, it marched to Camp Nelson, Ky., and on Sept. 1 marched toward Cumberland gap. It arrived in front of the gap on Sept. 7, and took part in the operations which compelled its surrender. On Jan. 3, 1864, a detachment under command of Lieut. A. B. Alger, in company with a force of 350 cavalry, while on a reconnoissance at Jonesville, Va., was compelled to surrender after 12 hours' fighting, for want of ammunition. On Feb. 14, 1864, Lieut. George W. Taylor was murdered by a Confederate citizen, near Barboursville, Ky., and on June 21, 1864, Peter Cornell was killed by Confederate guerrillas, near Cumberland gap. On June 27, 1864, the battery was ordered to Knoxville, Tenn., and on July 5, 1865, it was ordered to Camp Chase, Ohio, where it was mustered out on the 13th, in accordance with orders from the war department. 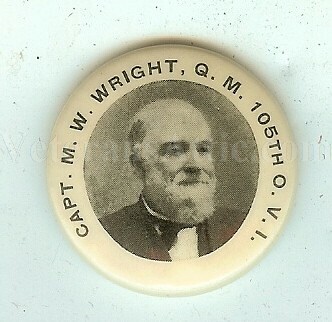 A nice pin back with the likeness of Captain Marshall W. Wright of the 105th Ohio Infantry. Written around the likeness of Captain Wright is "Capt. M.W. Wright, Q.M. 105th O.V.I.". The pin back is approximately 1 1/4 inches wide. 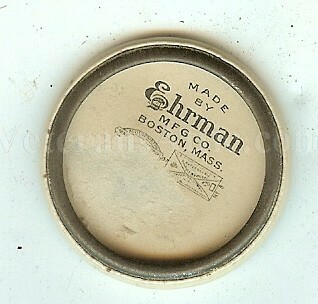 It was made by the Ehrman Manufacturing Company of Boston, Massachusetts as noted on the back of the pin back. 105th Regiment Infantry. Organized at Cleveland, Ohio, and mustered in August 20, 1862. Ordered to Covington, Ky., August 21, 1862; thence to Lexington, Ky., August 25. March to relief of Nelson August 30. Retreat to Louisville, Ky., September 1-15. Attached to 33rd Brigade, 10th Division, Army of the Ohio, to September, 1862. 33rd Brigade, 10th Division, 2nd Corps, Army of the Ohio, to November, 1862. 1st Brigade, 5th Division (Centre), 14th Army Corps, Army of the Cumberland, to January, 1863. 1st Brigade, 5th Division, 14th Army Corps, Army of the Cumberland, to June, 1863. 2nd Brigade, 4th Division, 14th Army Corps, to October, 1863. 2nd Brigade, 3rd Division, 14th Army Corps, to July, 1865. SERVICE.--Pursuit of Bragg into Kentucky October 1-12. Battle of Perryville, Ky., October 8. March to Munfordsville, Ky., October 12, and duty there till November 30. Expedition to Cave City October 31 and November 26. Moved to Bledsoe Creek November 30. Operations against Morgan December 22, 1862, to January 2, 1863. March to Nashville, Tenn., thence to Murfreesboro January 3-11, and duty there till June. Expedition to Auburn, Liberty and Alexandria February 3-5. Expedition to Woodbury March 3-8. Vaught's Hill, near Milton, March 20. Expedition to McMinnville April 20-30. Middle Tennessee (or Tullahoma) Campaign June 23-July 7. Hoover's Gap June 24-26. Occupation of Middle Tennessee till August 16. Passage of the Cumberland Mountains and Tennessee River and Chickamauga (Ga.) Campaign August 16-September 22. Shellmound August 21. Reconnoissance toward Chattanooga August 30-31. Battle of Chickamauga September 19-21. Siege of Chattanooga, Tenn., September 24-November 23. Chattanooga-Ringgold Campaign November 23-27. Orchard Knob November 23-24. Mission Ridge November 25. Demonstrations on Dalton, Ga., February 22-27, 1864. Tunnel Hill, Buzzard's Roost Gap and Rocky Face Ridge February 23-25. Reconnoissance from Ringgold toward Tunnel Hill April 29. Atlanta (Ga.) Campaign May 1 to September 8. Demonstrations on Rocky Face Ridge May 8-11. Battle of Resaca May 14-15. Advance on Dallas May 18-25. Operations on line of Pumpkin Vine Creek and battles about Dallas, New Hope Church and Allatoona Hills May 25-June 5. Operations about Marietta and against Kenesaw June 10-July 2. Pine Hill June 11-14. Lost Mountain June 15-17. Assault on Kenesaw June 27. Ruff's Station July 4. Chattahoochie River July 5-17. Peach Tree Creek July 19-20. Siege of Atlanta July 22-August 25. Utoy Creek August 5-7. Flank movement on Jonesboro August 25-30. Battle of Jonesboro August 31-September 1. Operations against; Hood in North Georgia and North Alabama September 29-November 3. March to the sea November 15-December 10. Siege of Savannah December 10-15. Campaign of the Carolinas January to April, 1865. Fayetteville, N. C., March 11. Battle of Bentonville March 19-21. Occupation of Goldsboro March 24. Advance on Raleigh April 10-14. Occupation of Raleigh April 14. Bennett's House April 26. Surrender of Johnston and his army. March to Washington, D.C., via Richmond, Va., April 29-May 20. Grand Review May 24. Mustered out June 3, 1865. Regiment lost during service 3 Officers and 104 Enlisted men killed and mortally wounded and 7 Officers and 126 Enlisted men by disease. Total 240. 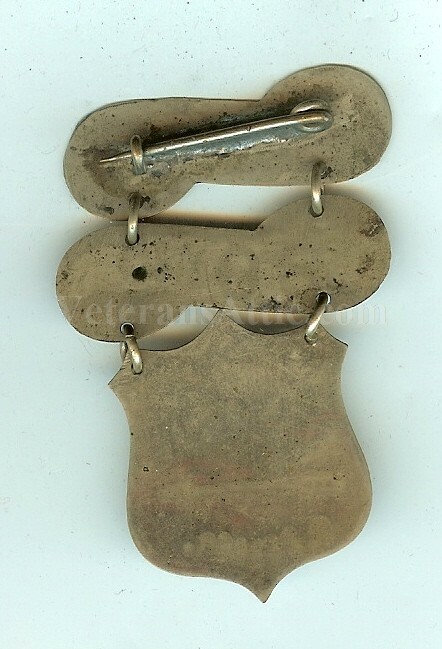 A neat pin back worn by a member of the 6th Ohio Cavalry at their reunion in 1898 at Warren, Ohio. An image of Major B.C. Stanhope is in the middle of the pin back. 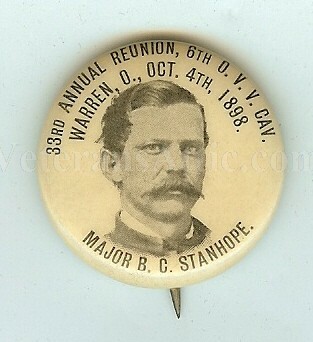 Written around the image of Major Stanhope is "33rd Annual Reunion, 6th O.V.V. Cav. - Warren, O., Oct. 4th, 1898. - Major B.C. Stanhope.". The pin back is approximately 1 1/4 inches wide. 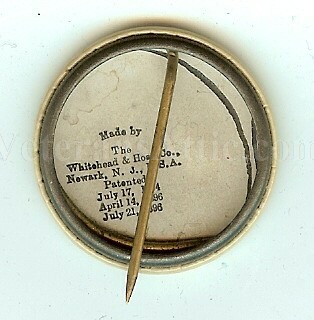 The manufacturer of this pin back was the Whitehead & Hoag Company, Newark, New Jersey. 6th Regiment Cavalry. Organized at Warren, Ohio, October 7, 1861. Duty at Warren till January, 1862, and at Camps Chase and Dennison, Ohio, to May, 1862. Moved to Wheeling, W. Va., May 13, thence to Strasburg, Va., and Join Fremont's army. Attached to Mountain Department to June, 1862. 2nd Brigade, 2nd Division, 1st Corps, Pope's Army of Virginia, to July, 1862. Cavalry Brigade, 1st Corps, Army of Virginia, to September, 1862. Cavalry Brigade, 11th Army Corps, Army of the Potomac, to February, 1863. 1st Brigade, 2nd Division, Cavalry Corps, Army Potomac, to June, 1863. 2nd Brigade, 2nd Division, Cavalry Corps, Army Potomac, to August, 1863. 1st Brigade, 2nd Division, Cavalry Corps, Army Potomac, to October, 1864. 3rd Brigade, 2nd Division, Cavalry Corps, Army Potomac, to May, 1865. Dept. of Virginia to August, 1865. SERVICE.--Strasburg, Va., June 1, 1862. Woodstock June 2, Mr. Jackson June 4. New Market June 5. Harrisonburg June 6. Battle of Cross Keys June 8. Near Mt. Jackson June 16. Rapidan River August 3-4 and 12. Pope's Campaign in Northern Virginia August 16-September 2. Fords of the Rappahannock August 16-23. Kelly's Ford August 21. Catlett's Station August 21-22. Fant's Ford, Great Run, August 23. Thoroughfare Gap and Haymarket August 28. Battle of Bull Run August 29-30. Expedition from Centreville to Bristoe and Warrenton Stations September 25-28. Reconnoissance to near Warrenton October 12. Thoroughfare Gap October 17-18. Haymarket October 19 (Detachment). Operations on Orange & Alexandria Railroad November 10-12. Reconnoissance from Chantilly to Snicker's Ferry and Berryville November 28-30. Berryville November 30. Battle of Fredericksburg, Va., December 12-15 (Detachment). Scout to Luray Valley December 22. Kelly's Ford March 17, 1863. Stoneman's Raid April 27-May 8. Brandy Station, Stevensburg, Beverly Ford, June 9. Aldie June 17. Middleburg June 19. Upperville June 21. Battle of Gettysburg, Pa., July 1-3. Monterey July 4. Smithburg July 6. Williamsport and Hagerstown July 6-7. Boonsboro July 8. Jones' Cross Roads near Williamsport July 10 and 13. Hagerstown July 11-13. Falling Waters July 14. Jones' Cross Roads July 15. Barber's Cross Roads September 1. Scout to Middleburg September 10-11. Advance from the Rapidan to the Rappahannock September 13-17. Culpeper Court House September 13. Rapidan Station September 15. Bristoe Campaign October 9-22. Warrenton or White Sulphur Springs October 12-13. Auburn Bristoe and Bristoe October 14. Advance to line of the Rappahannock November 7-8. Mine Run Campaign November 26-December 2. New Hope Church November 27. Reconnoissance to Front Royal January 1-4, 1864. Custer's Raid into Albemarle County February 28-March 1. Near Charlottesville February 29. Stannardsville March 1. Burton's Ford, Rapidan River, March 1 (Detachment). Rapidan Campaign May 3-June 15. Todd's Tavern May 5-6. Wilderness May 6-7. Todd's Tavern May 7-8. Corbin's Bridge May 8. Sheridan's Raid to the James River May 9-24. Childsburg and Davenport May 9. North Anna May 9-10. Ashland, Ground Squirrel Church and Yellow Tavern May 11. Brook's Church or fortifications of Richmond May 12. On line of the Pamunkey May 26-28. Haw's Shop May 28. Totopotomoy May 28-31. Cold Harbor May 31-June 7. Sumner's Upper Bridge June 2. Sheridan's Trevillian Raid June 7-24. Trevillian Station June 11-12. Mallory's Cross Roads June 12. Black Creek or Tunstall Station and St. Peter's Church, White House, June 21. St. Mary's Church June 24. Siege operations against Petersburg and Richmond June 24, 1864, to April 2, 1865. Warwick Swamp July 12, 1864. (Poolesville, Md., July 12, Detachment.) Demonstration north of the James July 27-29. Deep Bottom and Malvern Hill July 27-28. Lee's Mills July 30. Demonstration north of the James August 13-20. Strawberry Plains, Deep Bottom, August 14-18. Six Mile House, Weldon Railroad, August 20-21. Dinwiddie Road near Ream's Station August 23. Ream's Station August 25. Arthur's Swamp and Poplar Grove Church September 29-October 2. Expedition into Surrey County October 16-19. Boydton Plank Road, Hatcher's Run, October 27-28. Stony Creek Station December 1. Reconnoissance to Hatcher's Run and skirmishes December 8-10. Dabney's Mills, Hatcher's Run, February 5-7, 1865. Appomattox Campaign March 28-April 9. Dinwiddie Court House March 30-31. Five Forks April 1. Amelia Springs and Jettersville April 5. Sailor's Creek April 6. Farmville April 7. Appomattox Court House April 9. Surrender of Lee and his army. Expedition to Danville April 23-29. Duty in Sub-District of the Appomattox, Dept. of Virginia, till August. Mustered out August 7, 1865. Regiment lost during service 5 Officers and 52 Enlisted men killed and mortally wounded and 4 Officers and 177 Enlisted men by disease. Total 238. Residence was not listed; 25 years old. Enlisted on 10/3/1861 as a Captain. 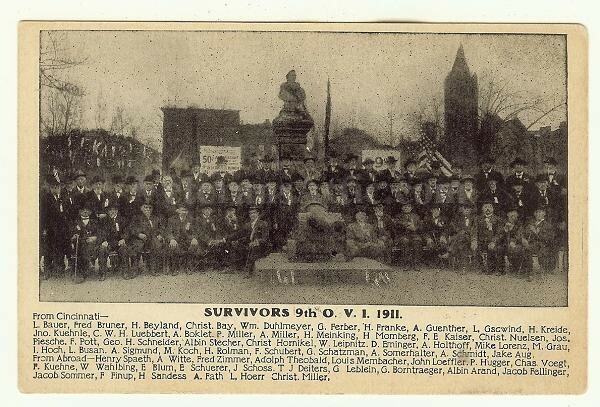 A great post card of the survivors of the 9th Ohio Volunteer Infantry in 1911 at their 50th Anniversary. 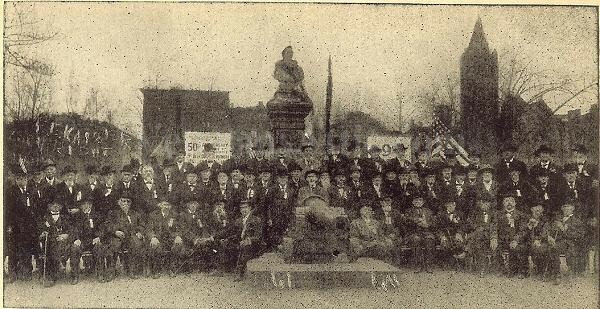 This image has a group of the 9th OVI veterans sitting behind a cannon. All the veterans are listed below the photograph. A neat post card from the reunion. Organized in Cincinnati under Col. Robert M. McCook. The members of the regiment were primarily of German descent. The 9th was mustered into three months service April 22nd, 1861 and reorganized into three years service May 28th 1861. It served in West Virginia under McClellan and transferred to the Army of the Potomac, July 27th, and to the Army of the Ohio, in December. The 9th did valuable service in Tennessee, and participated in the battle of Chickamauga, with heavy loss. It took part in the battle of Mission Ridge and was at the battle of Resaca during Sherman's Atlanta campaign. The Regiment's service having expired, it returned to Camp Dennison and was mustered out, June 7th, 1864. 9th Regiment Infantry (3 Months). Organized at Camp Harrison near Cincinnati, Ohio, April 22, 1861. Moved to Camp Dennison, Ohio, and duty there till May 27. Reorganized at Camp Dennison for three years May 27 to June 13, 1861, the first three-years Regiment from the State. Three months' men mustered out August 4, 1861. 9th Regiment Infantry (3 Years). Organized at Camp Dennison, Ohio, May 27 to June 13, 1861. Ordered to West Virginia June 16. Attached to 3rd Brigade, Army of Occupation, W. Va., to August, 1861. 2nd Brigade, Kanawha Division West Virginia, to November, 1861. 3rd Brigade, Army Ohio, to December, 1861. 3rd Brigade, 1st Division, Army Ohio, to September, 1862. 3rd Brigade, 1st Division, 3rd Corps, Army Ohio, to November, 1862. 3rd Brigade, 3rd Division, Center 14th Army Corps, Army of the Cumberland, to January, 1863. 3rd Brigade, 3rd Division, 14th Army Corps, to October, 1863. 2nd Brigade, 3rd Division, 14th Army Corps, to May, 1864. SERVICE.--West Virginia Campaign July 6-17, 1861. Battle of Rich Mountain July 10. Capture of Beverly July 12. Duty at New Creek till August 27. At New River till November 24. Moved to Louisville, Ky., November 24-December 2, thence to Lebanon, Ky., and duty there till January, 1862. Advance to Camp Hamilton January 1-17. Battle of Mill Springs January 19-20. March to Louisville, Ky., thence moved to Nashville, Tenn, via Ohio and Cumberland Rivers February 10-March 2. March to Pittsburg Landing, Tenn., March 20-April 7. (Presented by ladies of Louisville with a National flag for gallantry at Mill Springs.) Advance on and siege of Corinth, Miss., April 29-May 30. Ordered to Tuscumbia, Ala., June 22, and duty there till July 27. Moved to Decherd, Tenn., July 27, thence march to Louisville, Ky., in pursuit of Bragg August 21-September 26. Pursuit of Hood into Kentucky October 1-15. Battle of Perryville, Ky., October 8. March to Nashville, Tenn., via Bowling Green, Lancaster, Danville and Lebanon October 16-November 7. Duty at South Tunnel opening communications with Nashville November 8 26. Guard fords of the Cumberland till January 14. 1863. Duty at Nashville, Tenn., January 15-March 6. Expedition toward Columbia March 6-14. Moved to Triune and duty there till June. Franklin June 4-5. Middle Tennessee or Tullahoma Campaign June 23-July 27. Occupation of Middle Tennessee till August 16. Passage of the Cumberland Mountains and Tennessee River and Chickamauga (Ga.) Campaign August 16-September 22. Battle of Chickamauga, Ga., September 19-21. Siege of Chattanooga, Tenn., September 24-November 23. Reopening Tennessee River October 26-29. Brown's Ferry October 27, Chattanooga-Ringgold Campaign November 23-27. Battles of Orchard Knob November 23. Mission Ridge November 24-25. Demonstration on Dalton, Ga., February 22-27, 1864. Tunnel Hill, Buzzard's Roost Gap and Rocky Face Ridge February 23-25. Reconnoissance from Ringgold toward Tunnel Hill April 29. Atlanta (Ga.) Campaign May 1-25. Demonstration on Rocky Faced Ridge May 8-11. Battle of Resaca May 14-15. Advance on Dallas May 18-25. Left front May 25. Mustered out at Camp Dennison, Ohio, June 7, 1864, expiration of term. Regiment lost during service 6 Officers and 85 Enlisted men killed and mortally wounded and 2 Officers and 60 Enlisted men by disease. Total 153. 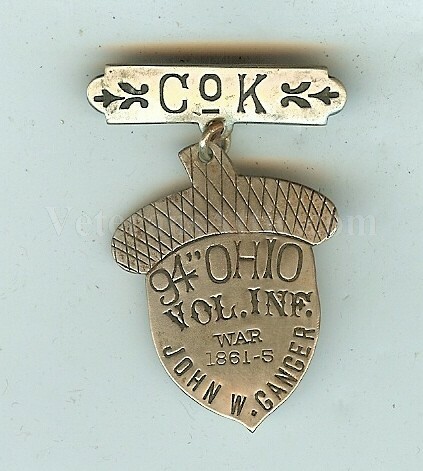 Offered is a super badge worn by John W. Ganger of Company K, 94th Ohio Volunteer Infantry. The hanger has “Co. K” written on it. 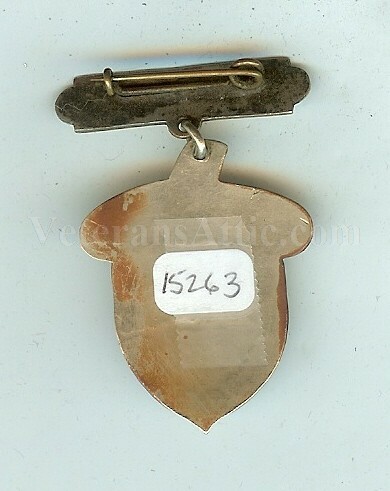 The drop which is attached to the hanger is in the shape of an acorn or 14th Corps symbol. Written on the drop is “94” OHIO VOL. INF. – War 1861-5 – John W. Ganger”. Residence was not listed; 19 years old. Enlisted on 8/11/1862 as a Private. 94th Regiment Infantry. Organized at Camp Piqua, Ohio, and mustered in August 22, 1862. Ordered to Lexington, Ky., August 28. Expedition to Yates' Ford, Kentucky River, August 30-September 3. Yates' Ford August 31. Tait's Ferry, Kentucky River, September 1. Retreat to Louisville, Ky., September 2-3. Attached to 9th Brigade, 3rd Division, Army of the Ohio, September, 1862. 9th Brigade, 3rd Division, 1st Corps, Army of the Ohio, to November, 1862. 1st Brigade, 1st Division, Center 14th Army Corps, Army of the Cumberland, to January, 1863. 1st Brigade, 1st Division, 14th Army Corps, to June, 1865. SERVICE.--Pursuit of Bragg into Kentucky October 1-15, 1862. Battle of Perryville, Ky., October 8. March to Nashville, Tenn., October 16-November 7, and duty there till December 26. Advance on Murfreesboro December 26-30. Battle of Stone's River December 30-31, 1862, and January 1-3, 1863. Duty at Murfreesboro till June, Middle Tennessee or Tullahoma Campaign June 23-July 7. Hoover's Gap June 24-26. Occupation of Middle Tennessee till August 16. Passage of the Cumberland Mountains and Tennessee River, and Chickamauga (Ga.) Campaign August 16-September 22. Davis Cross Roads or Dug Gap September 11. Battle of Chickamauga September 19-21. Rossville Gap September 21. Siege of Chattanooga, Tenn., September 24-November 23. Chattanooga-Ringgold Campaign November 23-27. Lookout Mountain November 24-25. Mission Ridge November 25. Pea Vine Valley and Graysville November 26. Ringgold Gap, Taylor's Ridge, November 27. Demonstrations on Dalton, Ga., February 22-27, 1864. Tunnel Hill, Buzzard's Roost Gap and Rocky Face Ridge February 23-25. Atlanta (Ga.) Campaign May 1-September 8. Demonstrations on Rocky Face Ridge May Buzzard's Roost Gap May 8-9. Battle of Resaca May 14-15. Advance on Dallas May 18-25. Operations on line of Pumpkin Vine Creek and battles about Dallas, New Hope Church and Allatoona Hills May 25-June 5. Pickett's Mills May 27. Operations about Marietta and against Kenesaw Mountain June 10-July 2. Pine Hill June 11-14. Lost Mountain June 15-17. Assault on Kenesaw June 27. Ruff's Station, Smyrna Camp Ground, July 4. Chattahoochie River May 5-17. Buckhead, Nancy's Creek, July 18. Peach Tree Creek July 19-20. Siege of Atlanta July 22-August 25. Utoy Creek August 5-7. Flank movement on Jonesboro August 25-30. Near Red Oak August 29. Battle of Jonesboro August 31-September 1. Operations against Hood in North Georgia and North Alabama September 29-November 3. March to the sea November 15-December 10. Siege of Savannah December 10-21. Campaign of the Carolinas January to April, 1865. Near Rocky Mount, S.C., February 28. Taylor's Hole Creek, Averysboro, N. C., March 16. Battle of Bentonville March 19-21. Occupation of Goldsboro March 24. Advance on Raleigh April 10-14. Occupation of Raleigh April 14. Bennett's House April 26. Surrender of Johnston and his army. March to Washington, D.C., via Richmond, Va., April 29-May 20. Grand Review May 24. Mustered out June 6, 1865. Regiment lost during service 2 Officers and 52 Enlisted men killed and mortally wounded and 1 Officer and 144 Enlisted men by disease. Total 199. 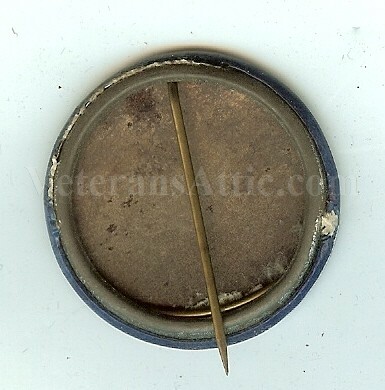 Offered is a neat identified badge worn by M. Zeller of Company F, 58th Ohio Volunteer Infantry. The badge has two ladders and one shield for the bottom drop. Written on the two ladders is “CO- F – 58 OHIO”. Written on the attached shield is “VOL. INF. – War 1861-65 – M. Zeller”. There are also crossed muskets and a 17th Corps arrow symbol. 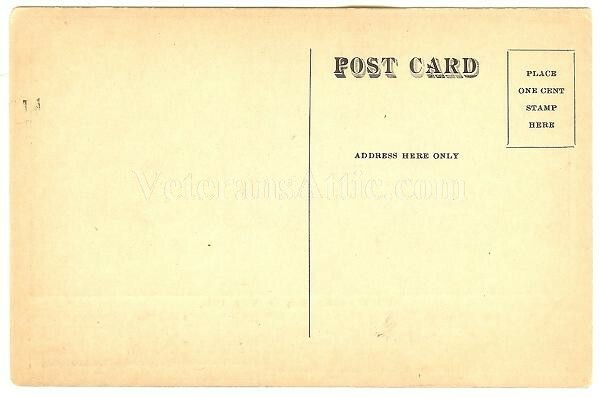 Enlisted on 12/6/1861 as a Private. Fifty-eighth Infantry. — Col., Valentine Bausenwein ; Lieut.-Cols., Ferdinand F. Remple, Peter Dister, Ezra P. Jackson, William S. Friesner; Maj., Andrew Gallfy. This regiment was organized at Camp Chase, from Oct. 1, 1861, to Jan. 28, 1862, to serve for three years. It remained at Camp Chase, perfecting itself in the "school of the soldier," until in Feb., 1862, when it was transported by rail to Cincinnati, and there embarked on steamers for Fort Donelson, Tenn., where it arrived on Feb. 13. Preparations were at once made to take part in the assault on the fort and after moving a short distance a furious attack was made by the enemy, but the shock was met with coolness, ending in the Confederates being hurled back into their intrenchments. Early on the morning of the 16th the regiment was marched to the center of the line, where it remained until the announcement of the surrender of the fort. It went into the battle of Shiloh on the morning of the second day's fighting and was under fire until 4 p. m., its loss being 9 killed and 43 wounded. Then came the tedious, exhausting march on Corinth, creeping with snail-like pace toward that miserable town, and after the evacuation the regiment with the rest of the army took possession. In a reconnoissance down the Mississippi on transports a Confederate steamer with 5,000 stands of arms and 2 pieces of artillery, was captured near Milliken's bend, La. In the affair at Chickasaw bluffs the regiment lost 47 per cent, of the whole number engaged. It remained in this vicinity until in January, when it reembarked on transports and sailed down the Yazoo river to its mouth; thence up the Mississippi and White rivers to Arkansas Post, where it took a prominent part in the capture of that place. In March an expedition was ordered up the Yazoo river to Deer creek, resulting in a three days' fight, in which the regiment lost a few men. In the battle of Grand Gulf the regiment lost heavily. It then joined the land forces at Vicksburg, where it remained until ordered home to be mustered out, which was consummated on Jan. 14, 1865. 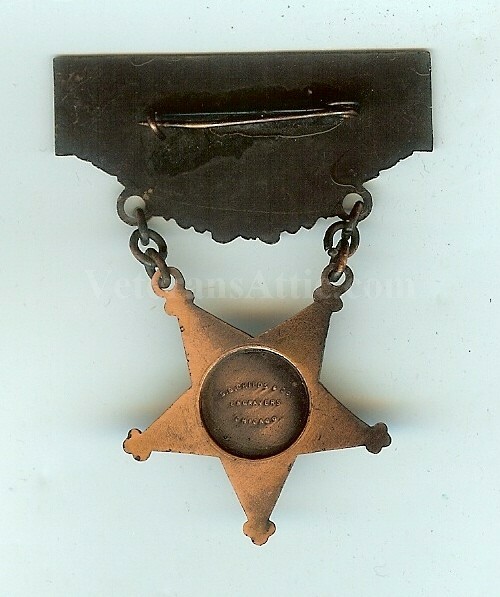 A neat badge worn by Union veterans who were members of the Washington County, Ohio, Veterans Association. The hanger is of a brass type metal with "Member" lodged in the middle. A red, white, and blue ribbon is attached. Attached to the ribbon is a celluloid disk with the likeness of President Abraham Lincoln. 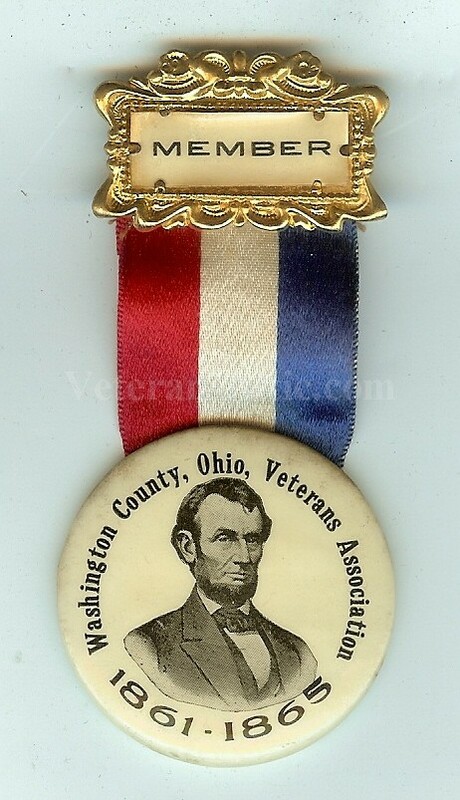 Written around Lincoln's likeness is "Washington County, Ohio, Veterans Association - 1861 - 1865". 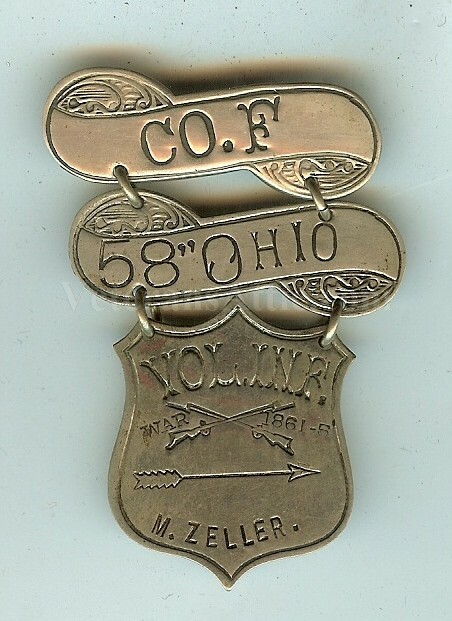 Another great badge worn by Ohio veterans at their Grand Army of the Republic Ohio Department encampment held in 1889 at Dayton, Ohio. The hanger is a simple metal bar with "Dayton, Ohio" written on it. A red ribbon is attached to the hanger. On the ribbon is "Delegate" in gold ink. Attached to the ribbon is a drop. In the center of the drop is the likeness of Daniel C. Putnam, the Department Commander. His likeness is surrounded by laurel leaves and a knap sack is over his head. On the knap sack "GAR". Written on the drop is "1887 - 1888 - Department Commander - Daniel C. Putnam". On the back of the drop is written "23rd Annual Encampment G.A.R. Dept. of Ohio - April 24.25.26. 1889. Dayton, Ohio". A nice badge worn by an Ohio veteran at the 1927 Grand Army of the Republic Ohio department encampment held in Canton, Ohio. 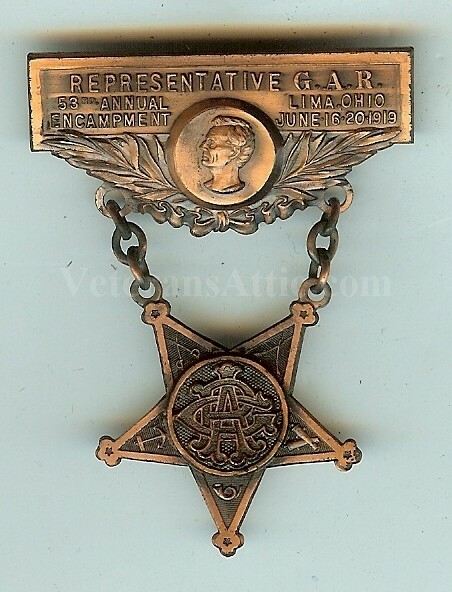 This nice three piece badge has a metal hanger with "G.A.R." in the slot and covered by a clear plastic piece. A red, white, and blue ribbon is attached to the hanger. Written in silver ink on the ribbon is "61st Annual Encampment - G.A.R. of Ohio - Canton - June 12 - 16, 1927". A metal drop is attached to the ribbon. On the drop is the likeness of the McKinley Monument. Written around the likeness is "McKinley Monument - Canton, Ohio". The badge is made by the Bastion Brothers Badge Company, Rochester, NY as noted on the back of the drop. 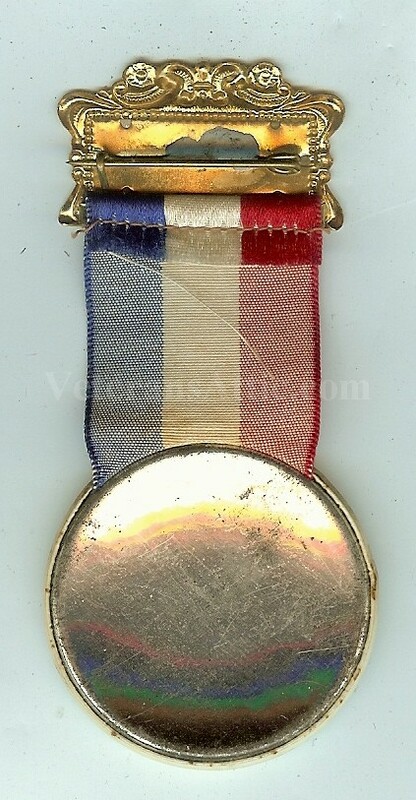 A beautiful badge worn by Ohio veterans at the 1905 Grand Army of the Republic Department of Ohio encampment held at Washington Court House, Ohio. The hanger of this badge has a court house with the scales of justice surrounding a likeness of George Washington. Written on the hanger is "Washington Court House - Souvenir". A really neat cavalry type hat is hanging from the hanger. Also attached to the hanger is a red, white, and blue ribbon. Attached to the ribbon is a drop with the Ohio state seal in the middle of the drop. Surrounding the drop is written "39th Annual Encampment G.A.R. - 1905". Surrounding the writing is a cannon, drum, cavalry horse, and several stacked muskets. 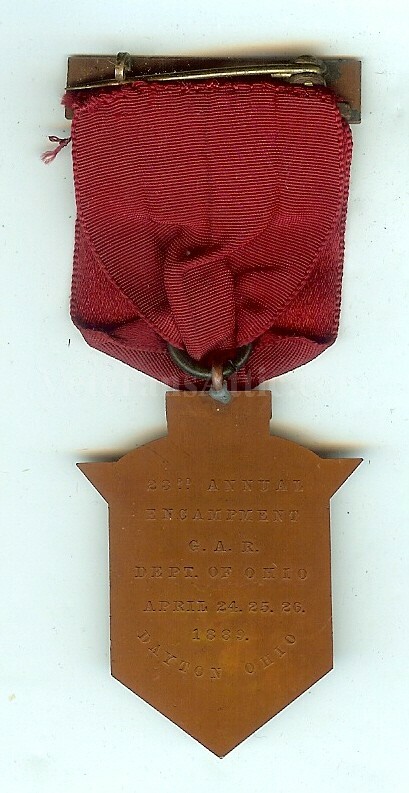 Written on the back of the drop is "39th Annual Encampment Department of Ohio - G.A.R. - Washington C.H. Ohio, June 6-7-8-9. 1905.". A very clean and nice badge worn by veterans at the 1924 Grand Army of the Republic Department of Ohio Encampment held at Warren, Ohio. 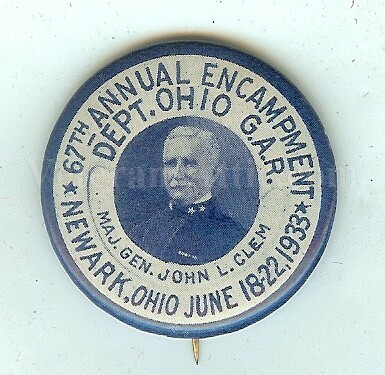 This great badge has a large hanger with a GAR membership badge on it with "Representative - GAR - Dep't of Ohio - 58th Ann'l Enc'pt - Warren, 1924" written on it. The attached drop has the likeness of General Simon Perkins in the middle of the drop. Written around the likeness is "General Simon Perkins". A red ribbon is attached to the hanger and is in good condition. General Simon Perkins (September 17, 1771 - November 6, 1844) was an early settler, businessman and surveyor of the Western Reserve of Connecticut, which would later become northeast Ohio. He co-founded Akron, Ohio with Paul Williams in 1825. He served as a brigadier-general during the War of 1812. Engraving of General Simon Perkins from Fifty Years and Over of Akron and Summit County by Samuel A. Lane from the original oil portrait by Jarvis. Simon Perkins was born on September 17, 1771, in Norwich, Connecticut. He was of mostly English descent though he also had small amounts of Scottish ancestry from his mother. He was the oldest son of Capt. Simon Perkins and Olive Douglas. His father died at age 41 in 1778 while serving in the Continental Army during the American Revolution. Simon was descended from one of the oldest English Puritan families of New England, and his ancestry went back to John Perkins who came to the new world with Roger Williams in 1631. His mother was a descendant of William Douglas, one of the founders of New London, Connecticut. At a young age, Perkins learned how to survey and in 1795 he went to Oswego, New York where he surveyed and worked in land sales for three years. In late 1797, he was employed by the Erie Land Company to become the company's land agent in Ohio. The Erie Land Company was organized by General Moses Cleaveland and other members of the Connecticut Land Company. He surveyed the company's land holdings in 1798 and established his headquarters in Warren, Ohio, where he lived the rest of his life. He remained an agent of the Erie Land Company until 1831. In 1801, he was appointed the first postmaster in the Connecticut Western Reserve, remaining in the position until 1829. In 1807, he established a mail route to Detroit by negotiating a treaty with Native American tribes after urging from Postmaster General Gideon Granger. In 1808, Perkins became a brigadier-general in the Ohio militia. In the War of 1812, he defended the northwestern portion of Ohio from Native American and British attack after General William Hull's surrender of Detroit in the fall of 1812. He commanded approximately 400 men. General Perkins established the Western Reserve Bank of Warren on November 24, 1813. This bank had 64 stockholders and a capital of about $100,000. He also assisted in founding other banks in Painesville and Norwalk. Additionally, Perkins co-founded the Brier Hill Iron & Coal Company, later the Brier Hill Steel Company in Youngstown, Ohio. He served as a trustee of Warren Academy, agent for Aetna Life Insurance Company, and stockholder and president of the Trumbull and Ashtabula Turnpike Company. Most importantly he served as state canal commissioner from 1826 to 1838, being one of the main planners for the route of the Ohio and Erie Canal. He also served as auditor of Trumbull County, Ohio from 1810-1812. Perkins was one of the largest land owners in the state. Portage County, Ohio records of 1815 show that he paid one-eleventh of all state real estate taxes from the county. Some of the townships listed are now in present-day Summit County, Ohio. Most of these holdings were acquired through outright purchases. Some of his holdings were in what is now Cuyahoga Falls, Ohio and western Akron, Ohio. On March 25, 1815, he purchased 1,298 acres from Samuel Parkman for $2.08 an acre. This tract would become most of downtown Akron. When he learned of plans for a canal system that would run from Cleveland to the Ohio River, he immediately began to make more purchases of more land in this area. Some of this land was located near Summit Lake, located in what is now south Akron. He hoped that the new canal would be routed through this lake, increasing the value of the land. In 1825, he was successful in convincing the other canal commissioners of this route and therefore donated land to the state for the canal right-of-way. Also in 1825, he and Paul Williams (a settler from Connecticut) donated 100 lots of land to the state, thus founding the City of Akron. It was recorded on December 6, 1825 at the Portage County seat of Ravenna. Due to its location at the highest point on the new canal, Akron quickly became a prosperous town. However, Gen. Perkins never lived in Akron. His oldest son, Colonel Simon Perkins, moved to the Akron area in 1834 to oversee his father's holdings in the area. His large house, the Perkins Stone Mansion, was completed in 1837 and remains to this day, now operated as a house museum by The Summit County Historical Society of Akron, Ohio. Col. Perkins also operated a large sheep farm and wool business, among other concerns, which for a time was managed by the abolitionist John Brown. General Perkins married Nancy Ann Bishop on March 1, 1804. They had nine children, Simon, Anna Maria, Olive Douglas, Alfred, Martha, Charles, Joseph, Jacob and Henry Bishop. Joseph became president of the Bank of Commerce in Cleveland and president and co-founder of Lake View Cemetery. He was also known for leading reform movements in Ohio jails and infirmaries. Jacob became manager and builder for the Cleveland & Mahoning Railroad. General Simon Perkins died November 6, 1844 in Warren. His wife died April 24, 1862. Original oil portraits of General and Mrs. Simon Perkins are on view at the Perkins Stone Mansion,.